Leaky Ceilings? Storm Damage? Let Us Help! Most of the time a leak in your roof can be a really easy and quick fix. Other times... well, it's complicated. Nonetheless, if you wait to get someone to look at it, it will just get worse. Mold and mildew can begin to develop and spread and just make things worse. You need to fix roof leaks when they happen, otherwise you are asking for trouble. So, don't wait until you run out of pots and pans. Fix that leaky roof now! ​Roof leaks around chimney's, vents or skylights are a common problem. Usually it's the flashing that has come loose and water has come in behind it. We can easily fix that. Valley leaks are another common roofing problem. When this is the case, we basically tear off the shingles that are in the valley, put down the ice and water shield and then replace the tiles as close in color as possible. With missing shingles and the unknown leaks, we must meet with the homeowner and do an assessment inside where the leaks are visible, then we will check the attic and lastly, we will look on the roof. If we can't determine exactly where the leak is, that's when we will start water testing. As a roofing repair contractor, we have to think like water in order to find the source of a leak. Water rolls downward, so the leak may actually be higher in the roof than most people think. In some cases we do water testing. We put one person in the attic and one on the roof, we get a garden hose and start from the bottom of the roof and move our way up until we find the leak. 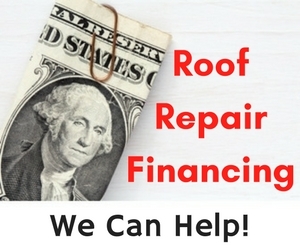 Let us know how we can help you with your leaky roof. When it's a real emergency, from high winds or storm damage. Don't let someone go up on your roof and throw a tarp over the leak. You are virtually ensured more damage, especially if it rains again. It's best just to call right away.